Living up to its name, Mammoth Mountain Ski Resort in California is big, bold and beautiful, with excellent facilities across a vast amount of terrain, yet it still has a laidback West Coast vibe. One of the biggest resorts in the US, Mammoth boasts fantastic terrain for all ability levels, and a vast range of amenities makes it a great family friendly ski destination. The stunning scenery of the Eastern Sierra Nevada mountain range. The relaxed small-town atmosphere, with some great Happy Hour specials. High-end facilities, infrastructure and terrain parks. Mammoth on a powder day goes off. An excellent family ski resort. Getting there isn’t the easiest. But that generally means it’s not too crowded. Weather and snow quality is a little unpredictable. It can get quite windy. Nightlife during the week can be pretty tame. Choose your accommodation location wisely as there are several base areas. Mammoth ski resort in California receives on average 400 inches (1016cm) of snow a year, yet it also has on average 300 sunny days a year. That adds up to a lot of blue bird powder days! 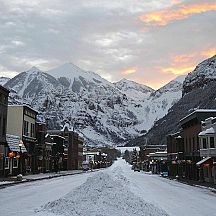 And although the past few years have seen well below that snowfall average, the mountain has managed to take great care of the snow that does fall, and thanks to its height above sea level (11,053ft/3369m at the summit) combined with 33 per cent of the runs being covered with snowmaking, it has even managed to extend the season beyond the expected closing date. Situated in the Eastern Sierra, Mammoth Mountain is accompanied by a stereotypical California town – Mammoth Lakes. We love its laidback mountain vibe and timber houses. At the resort and the town, there’s a good variety of restaurants, bars, retail and extra activities. There’s also something for every taste and budget when it comes to accommodation - from old school lodges, motels and dive bars to five-star hotels and condo properties. In general, the closer to the ski resort you get, the newer, bigger and grander the buildings. Due to its vast scale the layout the resort has several key base areas, each being quite separate and unique. The key base area is the pedestrian friendly Village. Funnily enough, the Village is a bit separate from the mountain - even though it’s connected via a gondola there are no ski runs that go all the way to the village. The Mammoth ski area is, well, mammoth. 3500+acres (1416ha) of skiable terrain make it California’s biggest and one of the largest in the US. When you’re skiing here the ridges seem to go on as far as the eye can see. And then there’s the whole backside to explore. The rest of the statistics are equally impressive; 28 lifts (including two express six-packs, 10 high-speed detachable quads and three gondolas), an uphill capacity of 59,000 riders an hour, 3100ft (945m) of vertical drop and the longest run is three miles (4.8km). Of the 150 marked trails, 25 per cent are for beginners, 40 per cent intermediate, 20 per cent advanced and 15 per cent expert. The snowfall is Mammoth's best statistic, with over 10 metres per season, alongside excellent snowmaking facillities that cover a vast percentage of the slopes. The elevation is a little higher than the resorts in Tahoe, so the snow is that little bit better quality. There’s gentle terrain for beginners at the Main Lodge ski base and Canyon Lodge area, with nice long mellow slopes to perfect those pizza turns. Meanwhile, experts will have a field day on one of the many chutes and double black diamond runs that surround the top of the front side. In particular, Chair 20 is fantastic for some tree skiing, and the Cornice Bowl provides super smooth and fast turns. If the snow coverage isn’t the best, a lot of these areas can be closed, but on a powder day they go off! Intermediates will love the sunny backside with its gladed runs and the endless long groomers on the main frontside. Almost 40% of the resort caters to intermediate skiers and snowboarders, so endless options to explore. Mammoth has some of the best terrain park facilities in the country – it even sports its own brand. Called Mammoth Unbound it consists of 9 parks, three half pipes, two acrobags, more than 100 jibs and 50 jumps. The parks are spread throughout the mountain with something for all standards. It has some great features for advanced freestylers with a 22-ft halfpipe and supersized jumps. Mammoth Mountain even has a freestyle team of 15 professional athletes so there’s a great chance you’ll see them in action (and perhaps learn a thing or two!). Mammoth is part of the new IKON pass, allowing you to explore more of the resorts in both North America and Canada! Contact us for more info. Mammoth makes an excellent choice for families. As well as great skiing for all levels, there’s a good variety of accommodation, including plenty of condo accommodation at decent prices, a ton of non-skiing activities and a good ski school where they’ll meet the resort’s mascot, Woolly the Mammoth! 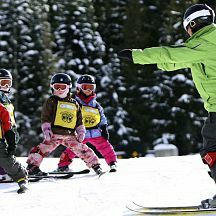 There are three main ski school centers: Woollywood at Main Lodge, Canyon Kids at Canyon Lodge and Eagle Lodge, so depending on where you’re staying there’s usually a ski school fairly close. There is child care for children aged up to eight in two locations (Main Lodge and The Village). The Woolly Tubing Park is super popular for families as well as the bowling alley & mini golf in Mammoth Lakes. There are some wonderful national parks and reserves located nearby, so those with a car have the opportunity to explore further afield. For lodging, families can stay slopeside at a variety of lodges and condos, conveniently located super close the the Main Day Lodge at Mammoth. 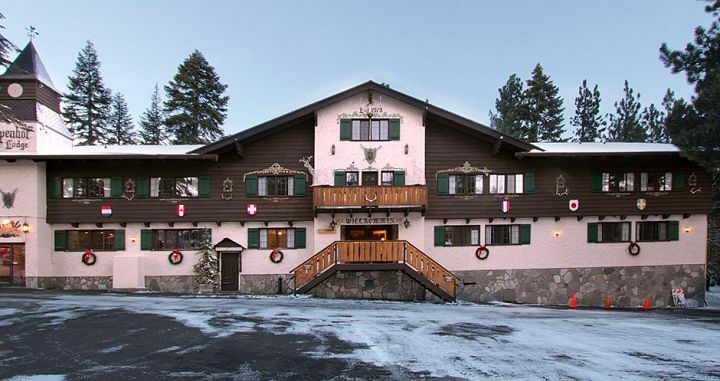 It's popular for families due to its proximity to the ski school and mellow beginner slopes. There is a resort shuttle that runs from this area to the main town, where there are more options in the way of restaurants, bars, and convenience stores. The Village at Mammoth is an upscale pedestrian village with many shops and facilities. 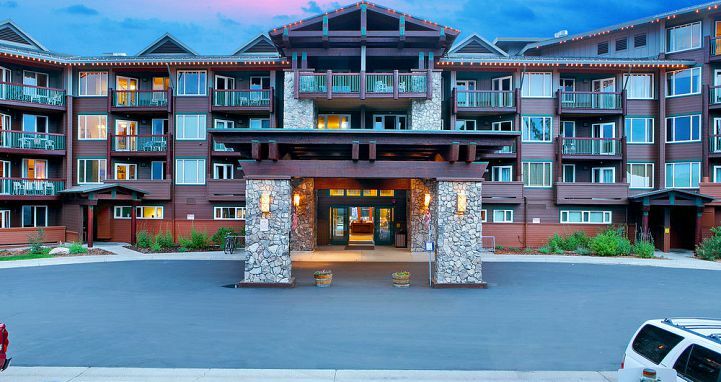 Most of the accommodation here are self-contained condos, within a few minutes walk of the Village Gondola (which provides access to the Canyons Lodge base area of the mountain). Mammoth is a fantastic option for a family ski vacation. As you would expect in a resort this size, there’s a wide variety of accommodation in Mammoth. 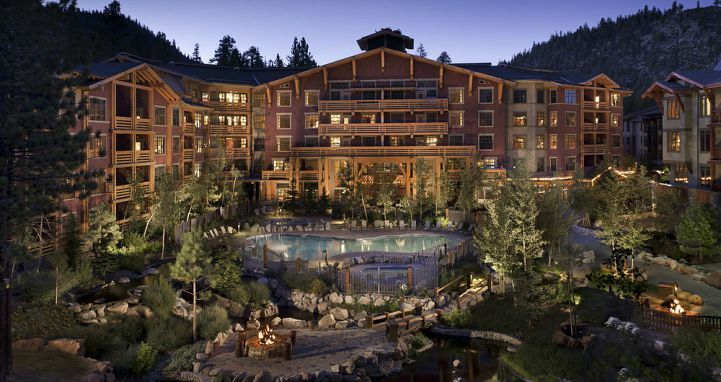 It ranges from chain motels to old-school lodges and five-star hotels such as The Westin. There are also a ton of vacation homes for rent and a wide selection of condo properties. The accommodation is spread all over the place, from downtown Mammoth Lakes to right in the center at The Village and from Eagle Lodge base area all the way across to Main Lodge. It’s important to understand the layout of the resort and character of each area so that you end up in the right place for your needs. Read our reviews to understand more about each of our selected Mammoth Accommodation properties and our travel experts can help you lock in the perfect Mammoth ski vacation. On and off the snow – you will never get bored in Mammoth. Some of the extra activities include: Snowmobiling, dog sledding, miniature golf (yes, open all year), tubing, ice-skating, winter fishing and cross-country skiing. 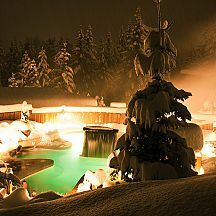 There are a couple of day spas and a small amount of shopping (nothing too fancy). Our Mammoth Scout Field Guide has more details about extra activities in Mammoth – free with any booking. 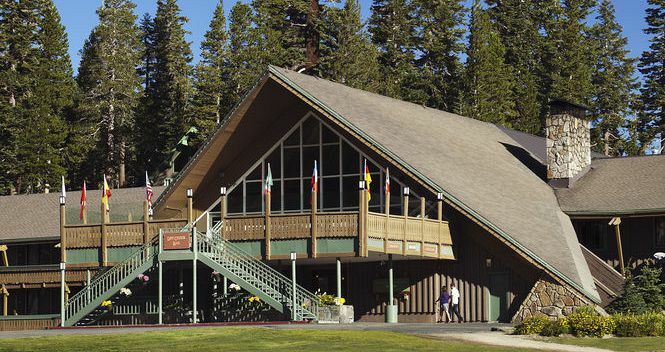 Mammoth is serviced by a small airport just a 10-minute drive from Mammoth Lakes. There are daily flights in winter from San Diego, Los Angeles, San Francisco and Denver. A little farther away, but with many more flight options, is the Reno-Tahoe International Airport. It’s a three-hour stunning drive and there’s a wide selection of rental cars available. Driving to Mammoth from LA takes about six hours, and from San Francisco it’s seven. Wherever you’re coming from, be aware of road conditions as some roads can close in winter storms. Distances between each of the different base areas and the main town are far, so walking isn’t usually an option. 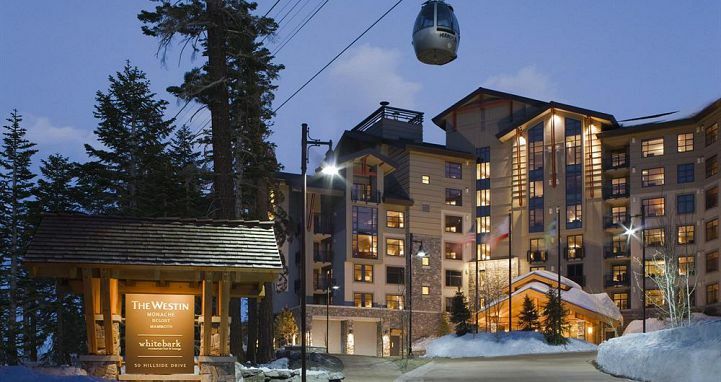 Fortunately, it’s not necessary to have a car in Mammoth as there’s an efficient and free bus system, and many of the hotels and properties offer their own shuttles. However, if you’re staying away from the main village and expect to be going out a lot in the evening, having your own set of wheels will certainly give you more flexibility. Mammoth ski resort has an extraordinarily long season extending from mid-November, typically until June. The most reliable times for snow quality are mid-January to late February. The Christmas and New Year Holidays can be very busy.